The Bag Sealing Machines made available by us are fabricated under the strict surveillance of our qualified engineers. Being a quality centric organization, our entire range of machines are fabricated at vendors' end as per industrial quality regulatory norms and conditions. Efficient utilization sophisticated designing patters and modernized machines enables us to offer comprehensive range of Bag Sealing Machine as per international quality standards. 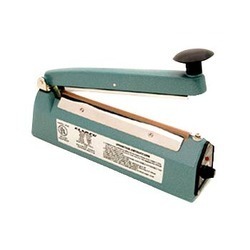 We offer our clients with a qualitative collection of Hand Operated PP Bag Sealing Machines. These are made by high quality raw material. They are widely used for various industrial purpose. These can be used for bag sealing. These can be made by quality raw material and as per the international quality parameters. We are one of the leading organization engaged in providing excellent quality Foot Operated Bag Sealing Machines. These foot operated PP bag sealing machines are widely appreciated by our clients which are situated all round the nation. High in demand, these foot operated PP bag sealing machines are available at most reasonable prices. These foot operated PP bag sealing machines are ideal for fast sealing of bags. Manufactured as per the international quality standards at our vendors end, these machines are highly efficient, durable and easy to operate.